In last Thursday’s post, I mentioned that Betsy Bonaparte’s older brother Robert married Marianne Caton. Marianne was the granddaughter of Charles Carroll of Carrollton, one of four Marylanders and the only Catholic to sign the Declaration of Independence. The family was wealthy and prominent. Marianne was three years younger than Betsy. 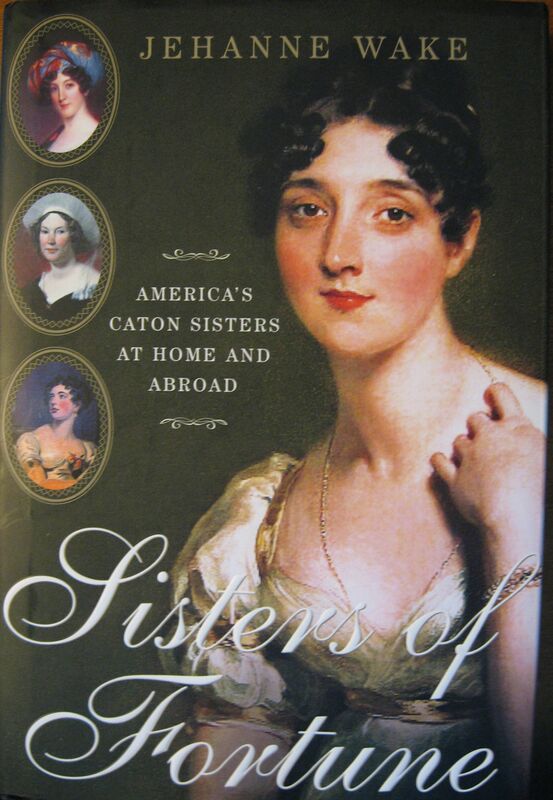 Beautiful, well educated, and sweet-natured, she was the oldest of four sisters: Marianne, Bess, Louisa, and Emily. (You can see all four of them on the book cover below, with Marianne’s portrait being the largest.) Betsy Bonaparte and Marianne Caton were the Paris Hilton and Kim Kardashian of their day, international celebrities known for their looks and their loves. And like our contemporary “famous-for-being-famous” cultural icons, both women had both private and public struggles. Marianne, who is my main focus today, struggled with poor health, particularly asthma. And to her deep regret, she was never able to have children. In the late 1810s, Robert Patterson and the three oldest Caton sisters travelled to Europe, partially to see if the climate would help Marianne. Known as the Three American graces, they became the toast of English society. In a strange twist of fate, the Duke of Wellington — the very officer who had defeated Betsy’s brother-in-law Napoleon — fell in love with Marianne Caton Patterson, even though she was married. Opinions differ as to whether the two became lovers or simply affectionate friends. They did exchange portraits to remember each other by. Back in the United States, Marianne became a widow in 1822 when Robert died of cholera. Three years later, she remarried, not Wellington, who still had a wife, but his older brother Richard, the Marquess Wellesley. It was a strange choice that I don’t completely understand — would you marry the brother of the man you loved but couldn’t have? — and the marriage was not particularly successful.